Sei whales are cetaceans of the baleen whale group (suborder Mysticeti) and are considered one of the 'great whales' or rorquals. Two subspecies of sei whales are recognized, B. b. borealis in the Northern Hemisphere and B. B. schlegellii in the Southern Hemisphere. These large animals can reach lengths of about 40–60 feet (12–18 meters) and weigh 100,000 pounds (45,000 kilograms). Females may be slightly longer than males. Sei whales have a long, sleek body that is dark bluish-gray to black in color and pale underneath. The body is often covered in oval-shaped scars (probably caused from cookie-cutter shark and lamprey bites) and sometimes has subtle mottling. This species has an erect "falcate", dorsal fin located about two-thirds down the animals back. They often look similar in appearance to Bryde's whales, but can be distinguished by the presence of a single ridge located on the animal's rostrum. Bryde's whales, unlike other rorquals, have three distinct prominent longitudinal ridges on their rostrum. Sei whales have 219–410 baleen plates that are dark in color with gray/white fine inner fringes in their enormous mouths. They also have 30–65 relatively short ventral pleats that extend from below the mouth to the naval area. The number of throat grooves and baleen plates may differ depending on geographic population. When at the water's surface, sei whales can be sighted by a columnar or bushy blow that is about 10–13 feet (3–4 meters) in height. The dorsal fin usually appears at the same time as the blowhole, when the animal surfaces to breathe. This species usually does not arch its back or raise its flukes when diving. Sei whales are usually observed singly or in small groups of 2–5 animals, but are occasionally found in larger (30–50) loose aggregations. Sei whales are capable of diving 5–20 minutes to opportunistically feed on plankton (e.g., copepods and krill), small schooling fish, and cephalopods (e.g., squid) by both gulping and skimming. They prefer to feed at dawn and may exhibit unpredictable behavior while foraging and feeding on prey. Sometimes seabirds are associated with the feeding frenzies of these and other large whales. Sei whales become sexually mature at 6–12 years of age when they reach about 45 feet (13 meters) in length, and generally mate and give birth during the winter in lower latitudes. Females breed every 2–3 years, with a gestation period of 11–13 months. 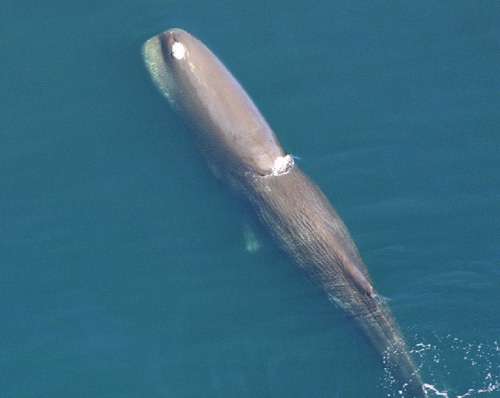 Females give birth to a single calf that is about 15 feet (4.6 meters) long and weighs about 1,500 pounds (680 kilograms). Calves are usually nursed for 6–9 months before being weaned on the preferred feeding grounds. Sei whales have an estimated lifespan of 50–70 years. Sei whales prefer subtropical to subpolar waters on the continental shelf edge and slope worldwide. They are usually observed in deeper waters of oceanic areas far from the coastline. Sei whales have a cosmopolitan distribution and occur in subtropical, temperate, and subpolar waters around the world. They prefer temperate waters in the mid-latitudes, and can be found in the Atlantic, Indian, and Pacific Oceans. During the summer, they are commonly found in the Gulf of Maine, and on Georges Bank and Stellwagen Bank in the western North Atlantic. The entire distribution and movement patterns of this species is not well known. This species may unpredictably and randomly occur in a specific area, sometimes in large numbers. These events may occur suddenly and then not occur again for long periods of time. Populations of sei whales, like other rorquals, may seasonally migrate toward the lower latitudes during the winter and higher latitudes during the summer. Sei whales were caught in great numbers in the Antarctic in the 1960s, after the blue, fin and humpback stocks had been overexploited. Japan has issued a permit to take up to 100 sei whales in the North Pacific for research. There are no agreed estimates of current numbers in the Antarctic. In 1989, the North Atlantic population was estimated at 10,500, and claims have been made for numbers ranging from 9,000–28,000 in the western North Pacific. It has been protected since the late 1970s in the Antarctic and North Pacific, and since 1982 in the North Atlantic.